Where's This Painting? 30 Years After Its Theft, Nobody Knows On the day after Thanksgiving 1985, a man and a woman walked into the University of Arizona art museum and walked out with Willem de Kooning's Woman — Ochre. An empty frame still hangs in its place. Thirty years ago, one of the most valuable paintings of the 20th century vanished. It wasn't an accident and it wasn't some elaborate movie heist. It was a simple theft — and it's still a mystery. It was the day after Thanksgiving in 1985. Staff at the University of Arizona Museum of Art in Tucson were getting to work, just like any other day. "It was almost 9 o'clock so the museum was gearing up to open the doors," says museum curator Olivia Miller. "The security guards opened the doors for one of the staff members, and two people followed behind." It was close enough to opening time that the guards let the man and woman come in. They started climbing a flight of stairs to the second floor, and the guard followed. In the middle of the stairwell, the woman stopped and turned to chat with the guard. Her partner continued on up. "A short time later the man came back down the stairs and he and the woman left," Miller says. A little odd, the guard thought. Then he walked up to the second floor gallery to discover any guard's worst nightmare: an empty frame where one of the institution's most prized pieces had hung. 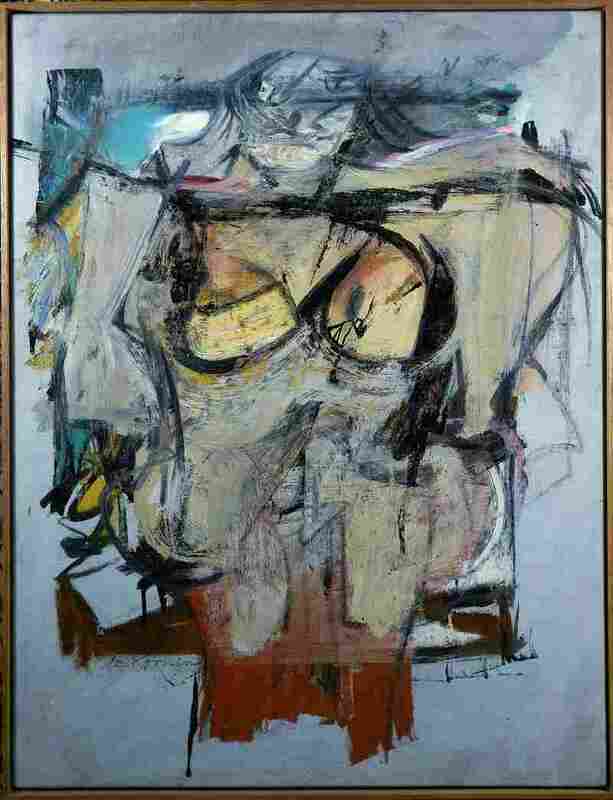 Willem de Kooning's painting Woman — Ochre had been sliced out of its frame. The painting is part of the abstract expressionist's celebrated "Woman" series. Another work in the series sold about a decade ago for more than $137 million. The museum estimates that today Ochre could be worth as much as $160 million. It was a huge loss. University of Arizona police chief Brian Seastone, a campus cop 30 years ago, was one of the first investigators to arrive at the scene. "It was almost a hollow experience because it was so empty," Seastone recalls. "Not only is this painting missing on this wall, it was just a very quiet scene." To make matters worse, there were basically no leads: no fingerprints, no license plate from the getaway car, just a description of how the couple looked. "The woman was a bit older," Miller says. "She had a scarf around her head, was wearing glasses. The man had dark hair, had a mustache." That's all the cops had to work with, because it turns out, in 1985, the museum didn't have any security cameras. No one who was working at the museum that day wanted to be interviewed for this story. So the question remains: Where is the painting? Irene Romano, a professor at the University of Arizona and an expert on art plunder, says in general, people who steal works like this are not art lovers. "They're common thieves who are hired by others to do the dirty work, and then the works of art pass into the underworld and are traded for drugs and arms and cash," Romano says. We'll always keep hope that the painting will come back. And at the same time we're always going to know that our collection isn't complete, and that's the sad part about it. So the University of Arizona's painting might have been sold on the black market and may be hidden away in a vault somewhere ... or it could even be hanging in someone's home. Today, all the public can see of Woman — Ochre are the frayed edges of the canvas in its empty frame. "We'll always keep hope that the painting will come back," says Miller. "And at the same time we're always going to know that our collection isn't complete, and that's the sad part about it." The University of Arizona Museum of Art got just $400,000 in insurance money for the painting, which it used to install cameras and beef up security. These days, it stays closed the day after Thanksgiving.